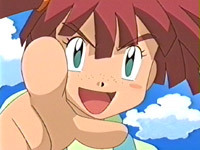 Japanese Episode AG 151: "The Day Care Worker and the Pokemon's Egg!" American Episode 421: "May's Egg-cellent Adventure"
While on the way to the Battle Dome, Satoshi and his friends stumble across a farm that specializes in raising pokemon eggs. Haruka and Masato, who had never seen a pokemon egg before, are excited at the prospect of seeing one hatch. As they do whatever they can to help out the farm's owners, Haruka learns about how Shiromi, the owners' daughter, aspires to become a Pokemon Coordinator. After losing a battle against Haruka's Gonbe, Shiromi reveals that the reason she hasn't started out on her own journey yet is because she's afraid of failing and making a fool of herself. As Haruka attempts to console the aspiring Coordinator, the Rocket-Dan appear in a giant robot and steal all the eggs. Shiromi steps up with her Rafflesia and stuns them long enough for Satoshi's Pikachu to send them blasting off with its newest attack, Volt Tackle. Now that all the eggs have been retrieved, Shiromi's parents decide to give Haruka a pokemon egg of her own! As our heroes resume their journey to the Battle Dome, Haruka wonders what kind of pokemon is waiting for her inside the egg. Now that the second Frontier Brain has been defeated, the show sort of goes into hyper overdrive mode. There will be very few fillers from here to the time we get to Satoshi's final Frontier Brain and it seems like every fan is happy about this...except for me. Now don't get me wrong - I hate bad fillers as much as the next guy. The problem I have with the show's pace in this beginning-middle part of the Battle Frontier is how unbalanced it makes the rest of the saga look. It's almost as if the anime producers realized that D/P were coming out in a little less than a year and was like "oh snap...we better get our asses in gear." It all reeks of flat-out bad planning, and I would have much rather they spread out the fillers more instead of loading them all at the beginning of the saga the way they did. I do have to praise the episode, however, for all the things it does right. We get two new attacks out of this one (Focus Punch and Volt Tackle) as well as a new pokemon for Haruka. Not too shabby. There are some annoying parts (Solar Beam being used at night, the weird "rubber arm" animation of Masato and Haruka waving at the end of the episode), but overall it's a decent episode. The dub kind of plateaus at this point. There will be certain parts that are better or worse than what we see in this episode, but for the most part, what we see here is what we'll be getting for the rest of the series. May sounds too much like Misty, though, and I hope that gets ironed out as the series progresses. There's also a painful number of egg puns throughout the dubbed version, proving that PUSA's writers are just as bad as 4Kids' staff at making me cringe with their incessant rewriting of everything that comes out of Musashi's and Kojirou's mouths. The ending theme in the Japanese version changes to Glory Day ~Kagayaku no Hi~ (the first version). It's kind of lazy for them not to come up with a new song, but I'll gladly take this over that bootleg Pokemon Ondo monstrosity they were playing before. They also do this neat thing with the credits where they sort of "recap" the episode by continuously playing clips from the episode in the upper left-hand corner of the screen, so that's pretty neat. Of course, we don't see any of this in the dub because white text on a black background is sooooooooo much cooler. The TO BE CONTINUED screen is freeze frame'd for three seconds. And...that's it. There's really nothing else to talk about for this comparison. So, to make sure this comparison wasn't a complete waste for you guys, I'll give you some trivia: the names of the family are all egg-related in the Japanese version. Shiromi means "egg white," Kimi means "egg yolk," and Chalaza is...well, chalaza. The English names, as far as I can tell, don't.